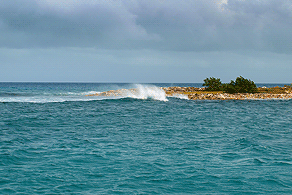 Barbados is an island kingdom, while the easternmost Caribbean island on the border. Situated in the easterrrn part Lesser Antilles, known as the Winward Islands (Winwarsd Islands). Lesser Antilles, know as the Winwards Islands ( Wiwadrs Islands). It is placed in isolation and coral reefs surrounde by an island that neighbours are St. Vincent and Grenadines and St. Lucia localed west, respectively west northwest of it. The island called by the Portuguesse navigator probably fig LosBarbados - bearded. Witha the exception of few areas in the interior of the island consists of lowwlands. The highest point on the island is Mount Hillaby (337m). The origin of the island is of volcanic origin. The main rock is limestone, which result from the action corals on the seabed, and was raised as a result of undermove South American plate under the Caribbean. The climate of the island the tropical trade winds keep temperatures relatively mild over the island and bring seasonal rains. Natural vegetation is the tropical rainforest and mangrove stands. Mangroves, however, were most of them damaged and largely replaced by sugar cane plantations and pastures. That sugar cane industry and its bound previously for the island's main source of livelihood. Today it was joined by tourism and banking. 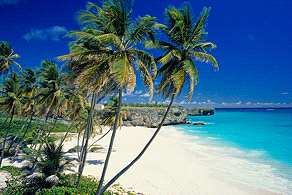 Eastern Caribbean Barbados is most popular tourist destinatiion thanks to its beautiful beaches. Turquoise sea and the white sand meets the idea of ​​a tropical paradise. It is the oldest known for the production of rum, a drink of seamen under the name Mount Gay Rum, founded in 1703. Popular Barbadian food is a sandwich of flying fish (cheap, fresh and always delicious). Barbados is also the birthplace of the currently known singer Rihanna. Grenada is an island country in the Caribbean Sea in the Lesser Antilles, also knownas spices. It consists from the island of Grenada and the southern part of the Grenadines archipelago, the largest island is Carriacou. The islands are volcanic origin. The largest island of Grenada is hilly (the highest peak 840 m above sea level)with a few rivers. the climate is tropical (warm and humid). The island of Grenada is located south of the hurricane areas and therefore there is avery rare occurrence of hurricanes. Exception but confirmed Hurricane Ivan in 2004, which destroyed or damaged 90% of the home. This island is known for great beaches covered with fine white sand (Grand AnseBeach). For the Grenade worth visiting Grand Etang National Park. It is a mountainous rain forest hidingbeautiful waterfalls and crater lakes. The top of Mount Piton is known for its panoramic view of all the world. We have something and lovers of water sports, thanks to excellent conditions for this kind of sport. Carriacou is a wonderful hospitable island where no cruise ships do not go. It is oneof the last places in the Caribbean, where you know the sweet life of the Indies. Carriacou toinclude the tiny islands near Hillsborough Bay. From the west is Sandy Island, a tiny coral island straight out of postcards. It has asparkling sand surrounded by turquoise water. Island to go in minutes. Islet White Island has beautiful sandy beaches and clean cliff, where you can snorkel. It lies about 1.6 km from the southern tip of Carriacou. Union Island is the southernmost island of the archipelago falling Grenadines Saint Vincent and the Grenadines. 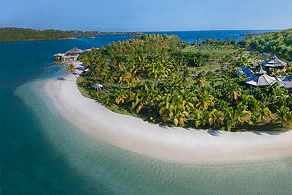 located 90 km southwest of Barbados and Carriacou Islands. Aston and Clinton are twomain cities. Its capital Clifton impression is confused maze of alleyways and concrete houses and energyradiating from him than anywhere else between the St. Kingstown. Vincent and St.George 'I Grenade. It has an international airport, but is used mainly for domestic flights to Saint Vincent and the Grenadines and international flights to Barbados, Carriacou, Grenada and Martinique. Flights are possible only during the day because the track is not lit. Due to their common origin is also known as Tahiti Indies. The island is about 4.8 km long and 1.8 km wide, so you feel you can go through the whole foot. 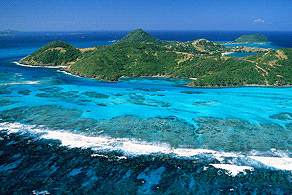 Surrounding islands are Tobago Cays, Mayreau, Palm Island and Petit St. Vincent. The highest mountain is Mount Tabou 333 meters above sea level. Transport around the island is local trucks mounted as coaches. Union Island is a dry, arid climate. The hills are not high enough to withhold rain water,which turns north coast to the rainforest. In the dry season (December-June) is the onlysource of water water on the island of the rainy season (June-December).